Onna is an e-discovery and knowledge management software created to gather tons of data from various sources and collect insights from those data, allowing you to make better and smarter business decisions and actions. It collected data from a myriad of highly popular business and productivity applications, including Confluence, Jira, Gmail, Zendesk, Slack, Drive, and Dropbox to name some. Onna automates all its data collection processes, resulting in fast and efficient discovery. Whatever purpose, whatever you are looking for, Onna will have the information delivered straight to you without you having to dig through documents, files, and paperwork. No more time wasted on information research. Onna will have all the information you need in two minutes so you can perform your functions and tasks without anything slowing you down. Onna speeds up information gathering and analysis, resulting in faster discovery by integrating with almost all data repositories and continuously extracting knowledge that you and your team can use to drive any task, decision, strategy, and more. And the software does all that even with sensitive information. That said, Onna is designed to ensure that all data handles and accessed remain secure in a system built using the highest security standards. Do you want to set a limit to the amount and type of information your users can gather and access? Onna lets you define roles as well as permissions to your users down to the granular level, ensuring that their access is contained to what you specify and nothing more. If on-premise deployment gives you more peace of mind, Onna lets you do just that. You can opt to run Onna entirely as an on-premise application to your own servers, eliminating any internet dependencies. The software is designed to scale from 1 to 10,000 users and still work smoothly even if you are near the limit. With machine learning and natural language processing capabilities, Onna can classify documents, dig through files, and sift through everything and only gather the information you need with powerful and robust analytics. What Problems Will Onna Solve? New technologies, like Slack, Zendesk, or Confluence, have been widely adopted across enterprises. 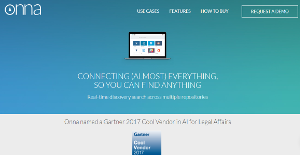 While these technologies are great in increasing productivity, enhancing collaboration, and improving customer experience, they can be a source of discoverable data when a company is faced with litigation. Many enterprises and eDiscovery service providers are faced with the challenge of integrating yesterday’s collection tools with the digital repositories of tomorrow. With Onna, they are able to collect data from over 20 data sources, including new media sources, for real-time eDiscovery collections and search. Enterprise knowledge is not only scattered across various departments, it is spread across all the different apps team members use on a daily basis. Having data scattered across all these different apps poses a great challenge when creating a centralized repository of enterprise knowledge. Onna allows enterprises to centralize data found across an enterprise through its data integrations, and since it automatically OCR files, it lets the user conduct a real-time search across his/her data. Additionally, Onna’s enterprise plans, cloud, and on-premise offer different types of users with different permission levels set on both a platform and matter/group level. The General Data Protection Regulation (GDPR) of the European Union (EU) will take effect for all 28 member states on May 25th, 2018. It was approved by the EU Parliament on April 14th, 2016 after four years of preparation. It replaces the Data Protection Directive 95/46/EC and aims to improve the rights of European citizens and residents in terms of the security and confidentiality of their personal information. The GDPR has been designed to reconcile the various data privacy laws existing across the EU member states in order to create a comprehensive and unified compatibility of data protection within the EU. Complying with the new GDPR rules will not be particularly easy for many companies. With Onna, companies can have real-time search across multiple repositories. Onna creates a central point of information and fulfills GDPR requests efficiently. Users can quickly respond to any subject access request by searching across the sources they have connected to the platform finding all relevant files, fast. Onna automatically processes and indexes all files associated to the source creating a fully searchable environment. If you are interested in Onna it may also be a good idea to check out other subcategories of Best Business Intelligence Software collected in our base of B2B software reviews. There are trendy and widely used systems in each software category. But are they automatically the best fit for your company’s unique needs? A market-leading software application may have thousands of users, but does it offer what you need? For this reason, do not blindly spend on popular systems. Read at least a few Onna reviews and think about the factors that you wish to have in the software such as the fees, main functionality, available integrations etc. Then, choose a few solutions that fit your wants. Check out the free trials of these platforms, read online reviews, get explanations from the maker, and do your investigation thoroughly. This in-depth homework is sure to assist you find the finest software platform for your organization’s unique requirements. How Much Does Onna Cost? We realize that when you make a decision to buy Business Intelligence Software it’s important not only to see how experts evaluate it in their reviews, but also to find out if the real people and companies that buy it are actually satisfied with the product. That’s why we’ve created our behavior-based Customer Satisfaction Algorithm™ that gathers customer reviews, comments and Onna reviews across a wide range of social media sites. The data is then presented in an easy to digest form showing how many people had positive and negative experience with Onna. With that information at hand you should be equipped to make an informed buying decision that you won’t regret. What are Onna pricing details? What integrations are available for Onna?